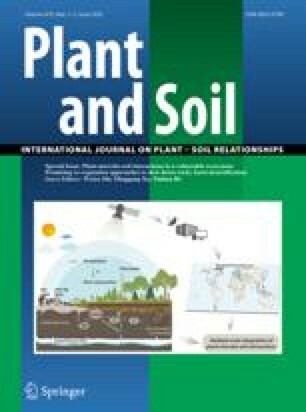 On the basis of a field experiment in Norway spruce with acid irrigation and compensatory liming of the soil surface (Höglwald, S-Bavaria), liming effects are described as lime dissolution rate, transformation of carbonate buffer to exchange buffer, time required for deacidification of soil and drainage water, mobilization of Cu and Pb, changes in soil organisms, humus decomposition, and nitrogen turnover. It was shown that lime dissolution followed an exponentially decreasing curve. 4 t ha-1 dolomitic lime were dissolved within 6 years. Additional acid irrigation of 4 kmol H+ ha-1 yr-1 as sulphuric acid speeded up the lime dissolution to about 4 years. After dissolution of lime about 70% of Ca and about 30% of Mg, both originating from lime dissolution, are retained in the surface humus layer, loading the exchange buffer capacity there. Liming acted as a protection against acid irrigation but the extension of soil deacidification downwards proceeded slowly due to the high base neutralizing capacity of protonated functional groups of the organic matter. The main depth effect is caused by Mg translocation. A significant increase of organic Cu complexes occurred due to mobilization of water soluble humus decomposition products. The effect of liming on litter decomposing organisms is demonstrated with microorganisms, collembolae and earthworms regarding the abundance and the structure of dominance. It was shown that liming may induce unusually large changes in biocenoses of forest soils. The decay of surface humus accounted for 7.2 t ha-1 or 23% of the store within 7 years. Within the same time span, liming caused a loss of about 170 kg N ha-1 or 14% of the store of the surface humus layer. The nitrate concentration in the drainage water thus increased by about 50 to 60 mg NO3- L-1. Site-specific conditions are discussed, which produce such negative liming effects as increased nitrate concentration of seepage, humus decay and heavy metal mobilization. Redistribution of tree roots, induction of boron deficiency and root rot are also considered. It is indicated that liming may aggravate the increasing problem of nitrate contamination of forest ground water resources which is associated with deposition of atmogenous nitrogen compounds. Some recommendations are given regarding forest practice.